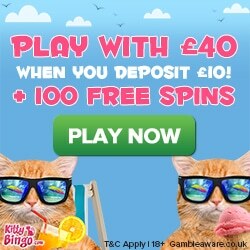 Kitty Bingo Mobile | You Have £30 FREE Bonus Cash Here! 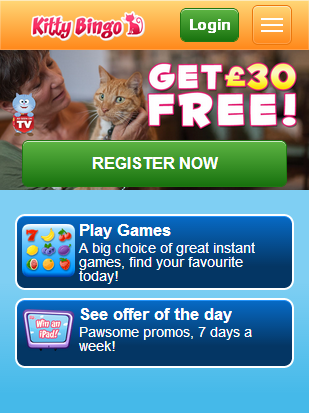 Register today at Kitty Bingo and you will receive a fabulous 300% welcome bonus. This means if you deposit just £10 now, you will receive £30 extra and a total of £40 to play. On top of that, Kitty will chuck in 100 extra free slots spins, just to sweeten the deal that little bit more! Other amazing reasons to join include, lucrative reload bonuses of up to 50%, access to free bingo games where you can win as much as £1000, competitions, daily jackpots as much as £2000 and up to 15% free cash back on all losses. They really do push the boat out! It’s not just bonuses and promotions at Kitty Bingo Mobile, you will find a fully functional and bespoke desktop and mobile experience. When the site launched, it launched without a mobile app. I think this was a smart move on their part, because they really wanted to ‘get it right’ instead of launch a half cooked product. And when you try the Kitty Bingo app, you will see what I mean, the wait paid off. The new app is compatible with virtually all Apple and Android devices. This means it will work great on your iPad, iPhone, iPad Mini etc. Plus it will work on all Android mobile devices and tablets. Also, for what it’s worth, you may be wondering if you have to register again if you have an account at the standard desktop site, the answer is this is no. You simply need to head over to the mobile homepage (no app download needed), put in your login details and start playing as you would normally. The mobile site uses the latest SSL technology to ensure that the server is secure and all data is encrypted, which should most definitely put your mind at ease. Win daily jackpots up to £2000. Bingo card prices start from as little as 1p each, however, if you are on a budget, you are welcome to take advantage of the free bingo offers. Aside from that, in order to take advantage of the £2000 of daily jackpot prizes, you need to make a deposit and become a funded player. In total there are 9 different bingo rooms, compared to other sites in the industry, each room is bustling with activity and just generally feels like a fun and enjoyable place to play. 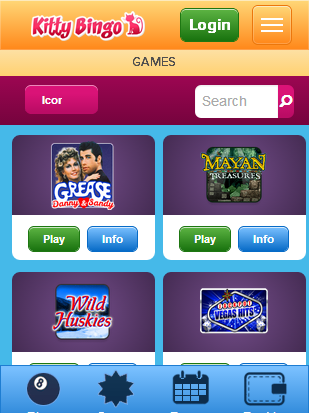 You will find a large selection of slots games, many of which are unique to them and won’t be found elsewhere. At the time of writing, there are well over 100 different games to choose from. Aside from standard slots games, you will find progressive jackpot slots, Roulette and a handful of scratch cards. Some of my favourites include Jazz Cat Slot, Cute and Cuddly as well as Doting Doggies, all of which fit the theme of the website perfectly. Min dep £10, max bonus £150. Spins on selected games credited in 5 batches of 20. Winnings capped at £3/day. 4x wagering (some games contribute more) and T&C apply. Whether you are a cat lover or not, you will undoubtedly enjoy playing at this top online bingo site. Perhaps the best reason to join is the 7 days free bingo or it could be the £40 welcome bonus. Either way, Kitty Bingo is one of the most rewarding sites out there. Not only do you get fantastic bonuses and promotions, you also get low bonus wagering requirement, fun filled games and a decent chance of actually walking away with a profit. It is of my opinion that you definitely check out this site. It's free to get started, so why not have a punt on us!